I adore anything written by Sophie Kinsella. Truly. She could write a pamphlet about the life cycle of salmon and I would read it. Twice. Her books are laugh-out-loud hilarious and I never want them to end. There's a bit of a love story twist woven into each one, but her stories have so much more to them than that typical "rom-com" nonsense. Anyway...I got very bored during the day, while he was at class or studying. This led me to the library. Yes sir, the very first thing I did with my brand-new Army I.D. card was check out a stack of library books. I fell in love with the book; the whole story of Becky Bloomwood. 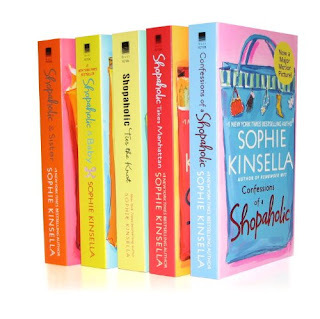 I subsequently read every sequel I could get my hands on and then every other novel written by Sophie Kinsella. I'm currently in the process of tracking down these books in used bookstores because, as my mother will tell you, I read books again. I never really get sick of re-reading the same book. I'm on reading #347 of Farmer Boy. So. That's the incredibly long backstory. On to Twenties Girl. It's a ghost story that is so much more interesting than a regular ghost story. It's not all caught up in the particulars of the ghost's existence. It's more character-focused. I appreciate that. Makes it more interesting. There's a character, a history, a job problem, a love problem, a family problem, a mystery. And a ghost. 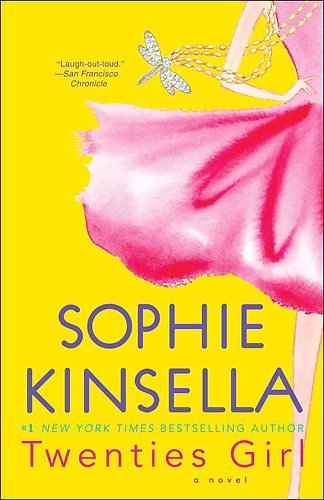 Kinsella goes into such detail that you do. not. want. the. story. to. end. I will certainly be reading it again. I think that my very favorite is The Undomestic Goddess. But I love all of her books!